Join Hermie and his garden friends as they teach Scripture through this new CD series that will provide kids with a fun learning experience. 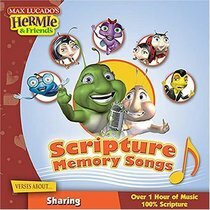 Hosted by the Hermie characters, each CD will be comprised of 10-15 Scripture songs (in stereo) sung by kids and taken directly from Scriptures using ICB, KJV, NKJV, NAS and NCV. Each CD will also feature a "missing word" version. As the song repeats, key words will be missing from the vocal in order to help reinforce Scripture memory. For parents who are looking for a tool to help kids learn God's Word, these Scripture Memory Songs will help kids of all ages learn with ease and fun as only Hermie & FriendsTM can! About "Sharing (Hermie & Frinds Scripture Memory Songs Series)"